The Studio Apartment Vida Loca is an ideal place for surfers and people who love the hustle and bustle El Médanos. It is centrally located just a few meters from the Plaza and the stunningly beautiful sandy beach, where both sun-worshipers, as well as surfers get their money. The modern apartment has a comfortable sofabed, a bathroom with shower and a small kitchen, which is fully equipped with electric cooker, fridge and freezer, toaster, coffee maker and microwave. The highlight is the large roof terrace (approx 30 m²). 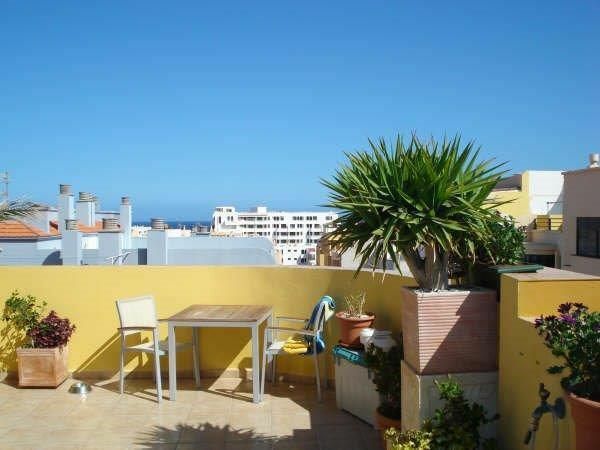 This offers a very nice sea views over the rooftops of El Medano. In the living area there is a flat-screen TV with satellite channels. Internet is available via Wifi free of charge. The beach is only 2 minutes away on foot. There are several supermarkets in the vicinity which are open even on Sundays. For surfers of El Medano is a paradise, because there is always blowing a pleasant breeze. El Medano (the dune), is the synonym for Tenerife's longest beaches and the popular high winds for windsurfers and kiters. This region can be regarded as absolutely safe sun, the sun shines at least 3-5 hours per day. Throughout the year, blowing trade winds, thereby prevails here a dry climate and it rains very rarely. , Also known as El Medano Surf City is the windiest place in Tenerife. The wind usually blows more than 4 Bft. Strong Wind days usually reach 5-7 BfT and peaks 9-11 Bft. The wind blows here side-shore and the wave reaches 1.50 m to 2.50 m. The spot is ideal for fun-surfing, diving and kite surfing. El Medano has developed from the former small fishing village to a thriving community. The place is not a tourist stronghold. The holidaymakers still lose themselves among native Tinerfeños. There are supermarkets, nice cafes, bistros and restaurants. Fish lovers will fully get their costs. At the pier and in the center you can enjoy inexpensive fresh fish and seafood. Directly on the town beach lies the Plaza 'El Medano'. Here in the evening takes place the very life between locals and tourists. The Playa Medano is 2 km long, starts and ends at the Plaza in the south in front of the red mountain, the Montana Roja. Behind, the 3 km long Playa de Tejita is with coarse sand and a nudist beach. The mere tourist places Los Cristianos and Playa de las Americas is carried out via the motorway in about 20 minutes. The Tenerife South Airport (Reina Sofia) is located by El Medano about 7 km away. You can reach the airport in about 10 minutes. Should the wind blow once not from the right direction, so the bay offers opportunities for diving and snorkeling in the many water underworld. There are also diving and snorkelling courses. Also for bikers there are excellent leisure facilities. Whether or without guidance with an experienced biker guys from the bike shop medanobike, are the setting and the wonderful island to explore. The bikes can be parked safely. Final cleaning: once per object Costs amounting to 90 EUR (Mandatory). Cot for children: per object and day available and included in price (Mandatory). Sehr schöne Ferienwohnung und nette Vermieterin. Super Lage im Ort. Cot (per property and day, included in price 0 EUR). Parking facilities (per property and day, included in price 0 EUR).